Callister and Co.: An invitation. Dave's Mom called me and asked if we would like to go to the grand opening of Draper's Amazing Pizza Co. in Sandy. It's one of those buffet, and game centers...our invitation included free food, free games, and free entertainment. We were all in! We got our invitation that admitted up to 6 family members. So I decided to invite My Aunt Jenni and Uncle Corey. Unfortunately Corey was sick, but we still met up with Jenni. It was crazy chaos. There were a Million people there. It was hard to get food, we had to do it in shifts so the girls wouldn't go crazy. And none of us really got full before we decided to play. I took Aubree to get a balloon and she decided that she wanted a purple flower. And she LOVED it. 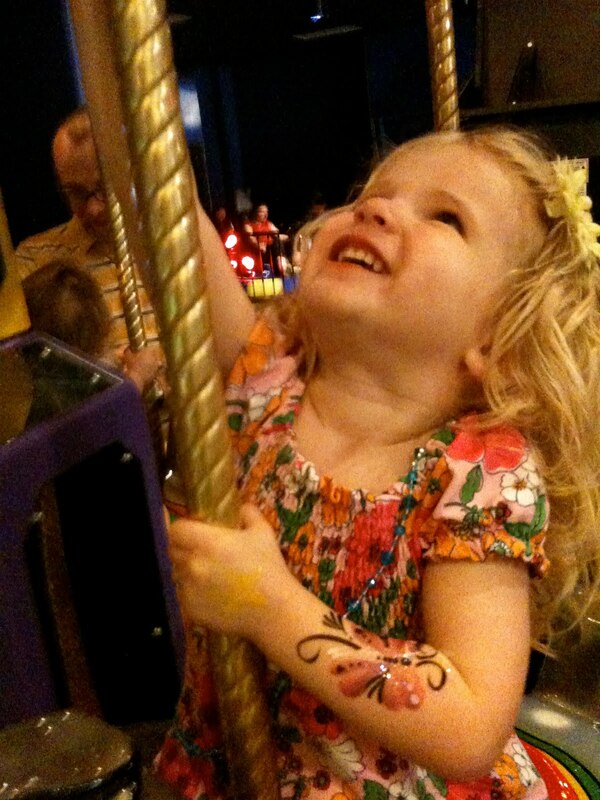 the only time she would let it out of her sight was when she was on rides. it was over stimulating at first but once we found the sweet spots, they had a blast. It was neat because they have a mini mini-golf course, mini bowling, bumper cars, go-karts, laser tag, all your classic arcade games and a fun kid center. That is where we spent most of our time. I felt kind of bad because we didn't spend too much time with Jenni...but I hope she had fun, and it's just nice to see her even if it wasn't all night :) in the kid center they have these cool car rides that go on a track, maybe they were trains...and they have a snail ride, a mini carousel, and a play area similar to play places in fast food restaurants. 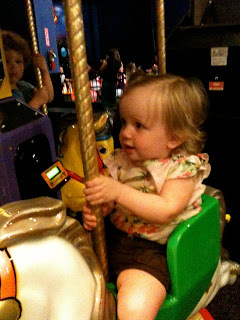 We spent 80% of our time on the carousel. The girls loved it, and they even had one with a little seat that Sophie could sit by herself. She felt so big. 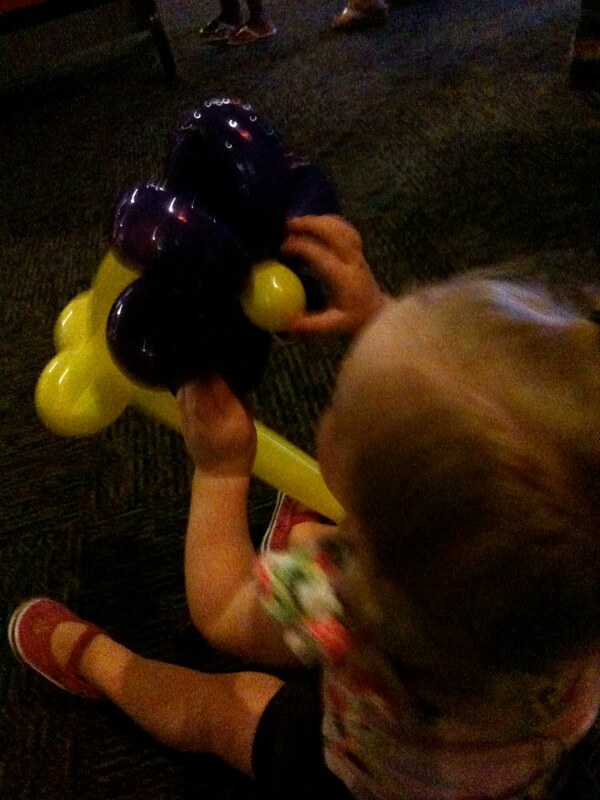 I didn't even think to get Sophie a balloon, but she commandeered Aubree's. This is the only shot I got of it. We left it there on accident, and Aubree didn't realize until she went to sleep and asked me if she could have her flower. I was hoping she would forget, but I told her we had to leave it there and that next time we would get one that she could take home....she handled it well. This time a flower, but she had to have the star on her hand again. I love this shot because her flower blends right in with her dress! We had such a good time there. We will be back soon. And I highly recommend it to all young families....and really anyone. Once we got home Aubree wanted to wipe off her arms. I had to ask her a bunch of times if she was sure, I didn't want her to regret it, but she was adamant. It was pretty funny, you can see her here looking down at the wipe...she thought it was "so beautiful" how it looked all smeared on the wipe. Funny girl. And this is Sophie representing. (a few days later) She can say "D-Will" and shoots her arm in the air like she's cheering. It's awesome. She can also say "thank you", "dog" "juice" "ball" "woody" (she loves toy story now too) and she has strung two words together and says "Hi, Daddy". But don't try to get her to say "Hi Mommy" it won't work. :( And she can pretty much repeat what we say. I love this stage when their vocabulary really takes off. It's so fun and it's a lot easier for her. It still throws me off she walks up to me and says "juice" and points to the fridge....but I love it. I did have a lot of fun. Thanks for inviting me. 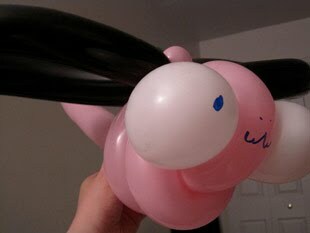 I got some cool prizes. One of them is meant for Aubree. She can add it to her squishy collection.